Kurdish independence votes sets the stage for regional standoff. Kurds Voted for Independence. What Happens Now? 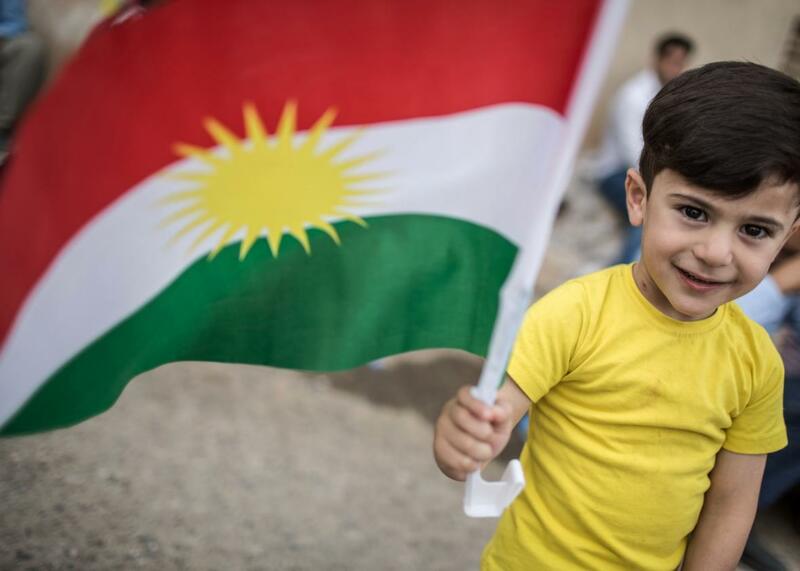 An Iraqi Kurdish boy holds a Kurdish flag at a school in Arbil that served as a polling station in the Kurdish independence referendum on Monday. Iraqi Kurdish leader Masoud Barzani has declared victory in Monday’s independence referendum, with a reported 72 percent turnout and 92 percent of Kurds voting in favor of the leaders of the already-autonomous region seeking full statehood. The margin of victory is higher than expected, but there was never much doubt that the majority of Kurds are in favor of independence. The question is how—or whether—that desire for independence becomes reality. The Kurdish Regional Government has not yet formally declared independence and has no immediate plans to do so. If the KRG unilaterally declared independence, it’s unlikely that more than a handful of foreign governments would recognize it, relegating Kurdistan to the ranks of unrecognized states like Abkhazia and Somaliland. The ideal outcome for Kurdish leaders would be to negotiate a separation with the Iraqi central government in Baghdad. But Baghdad is in no mood to talk and has ordered the Kurds to annul the results of the referendum and turn over control of their international airports by Friday, threatening a flight ban if they refuse. (The airports in the Kurdish cities of Erbil and Sulaymaniah are currently under the KRG’s control, and international travelers don’t need an Iraqi visa to land there.) The Iraqi Parliament has also called on foreign governments to remove their diplomatic missions from Erbil and urged Iraqi Prime Minister Haider al-Abadi to deploy troops to the disputed oil-rich area of Kirkuk. The ethnically mixed city is not formally under KRG control but has been under de facto control of the Kurdish armed forces—the Peshmerga—since 2014, when Kirkuk was recaptured from ISIS. The inclusion of this region in the referendum enraged Baghdad, which sees it as a land grab. The final decision on deploying troops is Abadi’s, and given the risks of opening a new military conflict at a time when ISIS has still not been entirely cleared from Iraqi territory, it seems more likely he will simply try to isolate Kurdistan and force it to back down. Despite its longtime relationship with the Kurds, the United States has opposed the referendum. A State Department statement described the U.S. as “deeply disappointed” that the vote went forward but hoped that the “historic relationship with the people of the Iraqi Kurdistan Region will not change,” particularly when it comes to fighting ISIS. Iran, which borders Kurdistan—and has a significant amount of sway in Baghdad as well as its own large Kurdish population—also strongly opposed the move. Iranian Kurds demonstrated in defiance of their government on Monday night. The only government that has openly backed Kurdish independence is Israel, which is not exactly going to help Kurdish efforts to win regional support. The most important country in this standoff may be Turkey. President Recep Tayyip Erdogan’s government strongly denounced the referendum. Turkey has been at war with its own Kurdish separatist movement, the PKK, for decades and is also staunchly opposed to the emerging PKK-aligned autonomous Kurdish region in Syria. But Ankara’s relationship with the Iraqi Kurds is a little more complex. Since 2014, the KRG has been able to export its oil through a pipeline to Turkey, creating an economic lifeline for the Kurdish region and decreasing its dependence on Baghdad. Turkish companies, many of them owned by ethnically Kurdish Turks, now dominate the Iraqi Kurdish economy. In return, Barzani’s party, the KDP, has provided the Turkish government with intelligence on the PKK and tolerated Turkish military incursions into its territory. Erdogan is still taking a hard line. “We have the tap. The moment we close the tap, then it’s done,” referring to Kurdistan’s oil exports. But he stopped short of making a specific threat to close that tap and Kurdish leaders are likely gambling that Turkish opposition will eventually soften. Either way, Kurdistan is still a long way off from full, internationally recognized independence. But whether it has any path toward, that goal will likely be determined by how its neighbors respond over the next few days.